There are many cleaning products that are sold in a more concentrated form than a few years ago but within the retail market there are limits. 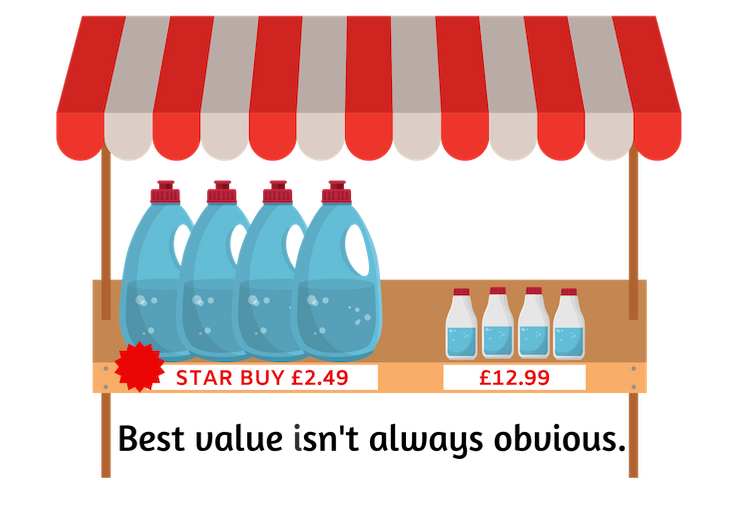 Retailers make better margins out of ready to use products and many customers prefer the convenience of a ready to use or modestly diluted product such as a detergent. There is also the issue of price, concentrates by volume are more expensive so unless you are prepared to do the sums ready to use can appear cheaper at a glance if sitting next to a concentrated product. It is also not lost on retailers that a concentrated product will last a long time so your 'buy frequency' will be extended meaning potentially less profit for them. We have some products where 250ml of concentrate can make 25 x 500ml bottles! Naturally, this is more useful to larger or commercial users but households can benefit too. As most of our products have a shelf life of up to 2 years, one bottle of concentrate could last a whole year. Think how much can be saved just in terms of cash and waste by using Fragile Earth concentrates. Fragile Earth believes that it is environmentally unsound to unnecessarily ship water and bottles to customers who already have them. By reducing bulk we all win on so many levels, our customers pay less, we all cut down on waste (all our packaging is recyclable) we buy less product, we re-use bottles and containers, we drastically reduce plastic waste, we reduce carbon emissions from production, transport and disposal, and all this is done with products made from natural ingredients. As our products are concentrates we use dosing bottles in order to help you measure the exact amount of concentrate for dilution or direct dosing, meaning accidental overdosing is difficult. Our dosing bottles help prevent spills and waste, if knocked over the bottle only loses what’s already in the chamber, you don’t need a separate measuring cup or measure plus best of all accurate dosing of our Fragile Earth concentrates helps save you money. Our bottles are safe, effective, economical and simple. To use, loosen the childproof chamber cap, gently squeeze the filled dispenser bottle with one hand, filling the dosing chamber to the required amount. The chamber has graduation marks in millilitres on both sides of the chamber. Once filled remove the cap to dispense the measured amount. This can all be done with one hand, which is so much neater and faster than two-handed dosing into a separate measuring container. Our 250ml bottles have a chamber capacity of 10ml, our 500ml and 1-litre bottles have a chamber capacity of 25ml. All our dosing bottles are made using recycled content and are 100% recyclable.